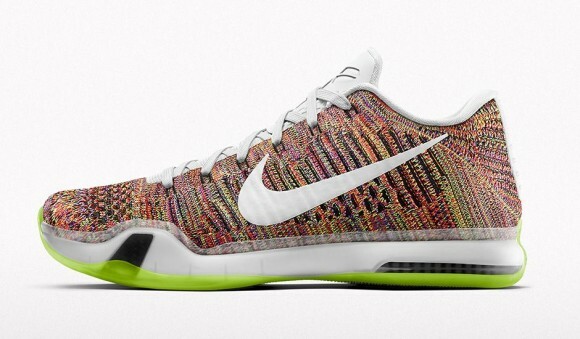 The popular multicolor Flyknit option returns to a NikeiD Kobe model, this time on the Nike Kobe X Elite Low. Last year around this time, Nike provided the option on the Kobe 9 Elite Low and it quickly sold out. The pattern restocked months later and sold out the second time as well. This Kobe X iteration is pretty much the same as last time, with a a different mixture of colors on each pair made making every pair unique. The typical options for the rest of the shoe are available, including glow soles, metallic gold and silver swoosh options, and speckling possibilities on the midsole. Click HERE to check out the options on the Nike Kobe X Elite Low ‘Multicolor’ option. So let me get this straight, you make a multicolored flyknit that’s probably supposed to draw attention because of it’s colour. And then you add the brightest outsole you could find to.. take all the attention away from the upper? Whut? Speaking of stupidity, who was the genius over at nike who thought that Kobe Bryant’s shoes were worth two hundred twenty five dollars? Scratch that, Nike does know their target audience, which is probably why they do not make too many Kobe Bryant shoes to begin with.